Big Game at Tilak Maidan as Churchill Brothers host NEROCA FC! Home / Indian Football / I-League / Big Game at Tilak Maidan as Churchill Brothers host NEROCA FC! By the time Churchill Brothers and NEROCA FC take the field at the Tilak Maidan in Vasco on Saturday, January 19 both teams will know whether it is only Chennai City FC ahead of them or even Real Kashmir FC. Be that as it may, arguably the biggest game of the day, scheduled for a 7.30pm IST start, promises to be one, not for the faint-hearted with two in-form attack-minded teams battling it out with realistic title aspirations foremost in their minds. Churchill Brothers have been the more impressive of the two sides, however of their two losses so far, one was to their Saturday opponents in the first-leg fixture. NEROCA, in that game, rode on a Katsumi Yusa brace to stun the high-flying Goans in that instance. 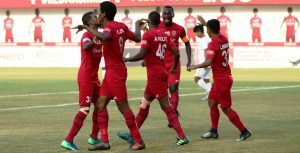 Churchill Brothers have regrouped since then and now lie second in the table with a five-point gap separating them from league leaders Chennai City FC. With the form that their striker Willis Deon Plaza has demonstrated so far with 11 goals, the hosts will be backing themselves to take three points at home. NEROCA go into Saturday’s game on the back of a narrow defeat, their third of the 12th I-League season, in their previous game against Mohun Bagan and will be desperate to get back to winning backs to remain hot contenders for a shot at the title. The fluent style of both teams and the quality in attack with the likes of Singham Subash Singh, Felix Chidi for NEROCA and Dawda Cessay, Anthony Wolfe for Churchill Brothers, the game promises to be a cracker under the lights in Goa. Previous Qualified Teams confirmed for the FIFA eClub World Cup 2019! Next VIDEO – I-League: Shillong Lajong FC vs Real Kashmir FC – Promo!